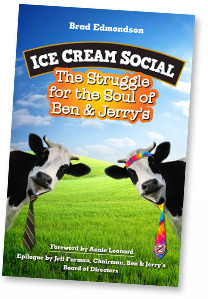 Ronald Soiefer was Chief Counsel of Unilever USA when it acquired Ben & Jerry’s in 2000. In this clip, Ron describes the principles of the sale agreement, which took 18 months to negotiate. This presentation was given in 2009 at a conference called “Selling Without Selling Out.” Ron’s full presentation, and others from Seth Goldman, Gary Hirschberg, Judy Wicks, and others, are posted here. By the way, the sale agreements between Ben & Jerry’s and Unilever are public documents on file at the federal Securities and Exchange Commission. Instructions about how to find them are here.